Sanctum is one of those classic stories about a team of distinct personalities lending their specific skills to a highly specialized mission. Then something goes wrong and those skills either help them escape or seal their doom. The film builds as much suspense as it can on the diving alone. Carl does a daring base jump into the water. The crew sends lights after the divers via remote control. A tank leak fills a diver's mask and threatens to sink her. That's all dangerous or technical, but it seems like you'd have to really be a pro diver to find any of it suspenseful. Sanctum is a 3D film. During an underwater cave exploration in Papua New Guinea, five people are trapped when a cyclone starts flooding the cave. With the water going up and the oxygen running out, their only hope of survival is to travel through the unexplored underwater caves following the course of the river that leads into the ocean. 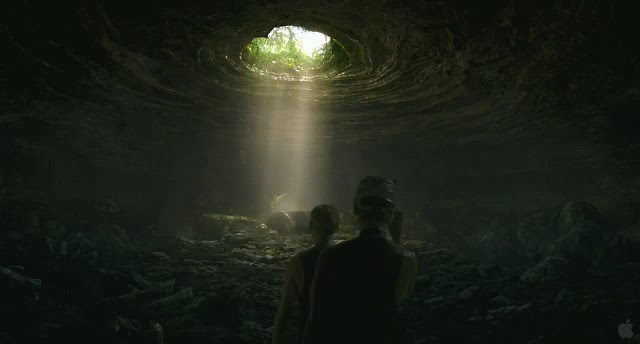 The film begins with the explorers Josh (Rhys Wakefield), expedition bank-roller Carl Hurley (Ioan Gruffudd) and his girlfriend Victoria, reaching the cave by helicopter at the Esa-ala cave site. Upon reaching the cave it is made known that Frank McGuire (Richard Roxburgh), Josh's father and a master diver, has already set up a forward base camp deep inside the cave. The team has been exploring the cave system for months, and have set up an excellent communication network that allows communication with the camp from above. While Victoria and Josh rappel down the cave, Hurley chooses to dive and parachute into it, reaching the base camp before Josh and Victoria. While the guests get comfortable, Frank and Judes decide to explore an unexplored section of the cave known as Devil's Restriction. Squeezing through a narrow passage they reach a giant cavern with huge ceilings, but while they are returning, Judes' hose snaps. With no backup tank, Frank offers Judes his hose to buddy breathe. After exchanging the mask twice, Judes begins to panic and refuses to let go of Frank's hose. Frank reluctantly pushes her away so that he can breathe, and Judes dies in front of his eyes. The entire action is captured and witnessed by the members of the forward base through the rover trailing the divers. Josh accuses Frank of murdering Judes, while Frank explains that Judes knew the risks, and that Josh was responsible in part for the accident since he failed to procure the backup tanks. Meanwhile, a fierce storm develops on the surface, and attempts by the surface team to warn the divers fail. Unaware of the storm, the divers decide to return to the surface where they encounter water gushing in. They are unable to escape and regroup with the dive team. During the escape Luko is badly injured and Frank is forced to mercy kill him. Later George, Frank's buddy, suffers from decompression sickness and stays behind so that he will not slow down the group. Victoria dies crossing a gorge in the cave when she does not heed Frank's warnings, becoming trapped in the equipment and falling into the churning waters below. The divers lose all but one rebreather in the accident. The teams regroup and decide to rest. Frank explains that he intends to use the rebreather to dive and find a way to come back for them. Carl, maddened by grief, suddenly dives in with the last tank and Frank loses him in the cave. Josh happens to find bat droppings and infers that there might be a way out, because bats only use passages (and entrances) that are big enough for humans. The two make their way out and find an opening up to the surface along with a tank that crashed through. They both decide to find another way through the cave rather than wait to be rescued. They find a paranoid Carl who attacks Frank and mortally injures him before diving back into the cave without tanks in hope of finding a way. Josh is forced to mercy kill his father in the same manner as Frank mercy killed Luko. Josh dives and continues to swim on a single tank. When his light dies, he uses the light in the boar tooth his father gave him. Finally the tank runs out of air and Josh, remembering his father's words, uses air bubbles trapped on the cave ceiling and continues ahead. Finally exhausted and on the verge of giving up, Josh sees sunlight ahead and breaks the surface, emerging in the Solomon Sea.